On the morning of September 5th, 1975, Lynette “Squeaky” Fromme, an associate of the infamous Manson Family cult, drew a handgun from a folkloric red robe and aimed the weapon at the body of then president Gerald Ford while the commander-in-chief and his entourage were walking through the grounds of the California State Capitol in Sacramento. Before a cacophony erupted, in which Ford was escorted to safety and the assailant was apprehended by the authorities, witnesses reported hearing a menacing, but ultimately benign click issue from the pistol; Fromme had intentionally ejected the round loaded in the gun’s chamber before leaving her apartment that morning. Fromme was tried for attempted assassination—found guilty—and sentenced to life imprisonment. Any jury would be hard pressed to dismiss her actions as merely a macabre practical joke. The bizarre nature of her crime still remains: Squeaky Fromme did not become a murderer on that late summer day, nor does it seem that she ever intended to. Her assassination attempt was purely symbolic; her sentence was doled out on the grounds that the thought of doing violence against the nation’s leader had entered her mind and been subsequently manifested into the world as a kind of innocuous performance of homicide. While Rose Salane’s recent exhibition at London gallery Carlos/Ishikawa deals with subject matters considerably more lighthearted than a would-be political slaying, the unsettling fusion of theater and reality in Fromme’s criminal record is a fitting lens through which to introduce Salane’s work. 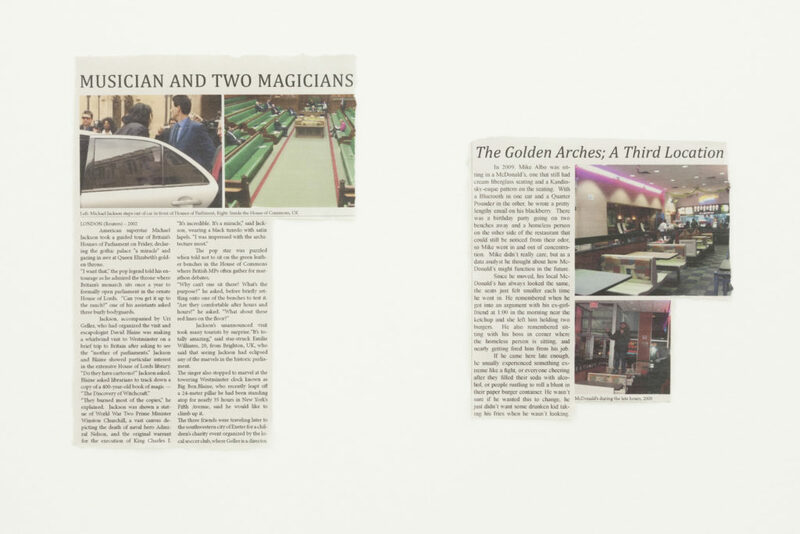 Appropriately titled All These Events Are True, But None of Them Happened, Salane’s exhibition is rooted in a series of ersatz newspaper clippings that describe the actions of believable—sometimes even affirmatively real—people. A framed cut in Musician And Two Magicians (all works 2018) recounts a tour of the Houses of Parliament given to pop star Michael Jackson accompanied hyperbolically by illusionists Uri Geller and David Blaine. When The World Seemed New tells of some casual banter exchanged between Ronald Reagan and Margaret Thatcher during a photo shoot in the Rose Garden. So materially precise is the fabrication of these counterfeits, that one is almost fooled into believing that they hold some veracity. It is only through the writing and photographs contained in the trimmings that our suspicions of a lingering inauthenticity are roused. With a conviviality that would be utterly intolerable to the conventions of journalistic writing, Reagan and Thatcher are referred to simply as Ronald and Margaret. The images covering the King of Pop’s visit to the United Kingdom read more like stock photos or extremely low-quality paparazzi snaps, image types that would be unacceptable to even the most frivolous of tabloids. To further provoke our sense of unsureness, Salane has used these newspaper narratives as a springboard for certain sculptural elements in the exhibition. MT in the Oval Office, for instance, is composed of an architectural excerpt of that space containing a baseball, “signed” by the Iron Lady herself, that makes a brief appearance in the text of When The World Seemed New. While it almost always makes for a delightful viewing, the gesture of blending the replicated with the real is not in itself a novel one. Piqued by the paranoid thought of academics such as Jean Baudrillard and Jean-François Lyotard, scores of artists since the 1980s have built entire practices out of making artworks that straddle the already porous boundary between simulation and the world it surpasses. 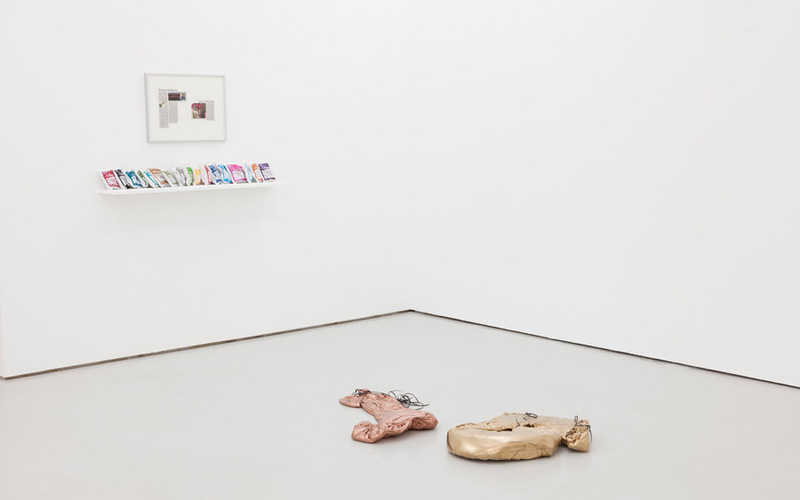 One needs only to recall the respective oeuvres of artists such as Charles Ray or Gavin Turk to see how the conceptual toolkit that builds the foundation of Salane’s work is composed of interesting albeit well-worn ideas. This is not to say, however, that All These Events Are True, But None of Them Happened is an exhibition of derivative works. To read this art as simply a simulacral romp through printmaking and sculpture would be to hastily dismiss the discipline that grounds the strongest moments in the show: writing. Specifically, the sort of literary fiction that is enhanced by its staging across media other than the written word. Far from the deceptions of Ray and Turk, Salane’s finest works have more in common with ekphrastic virtuosos like W.G. Sebald or Ben Lerner. In a piece like Let Us Not Forget The Scene, the events described in the newspaper article are simply too banal for the viewer to be even momentarily fooled into believing the scrap of paper came from a legitimate publication. The story opens with a man—Ron, the familiarity of the address appropriate now—enjoying a moment of respite before going to work dumping confetti on the revelers pooled in the streets of Times Square on December 31st, 1999. As the piece progresses, Salane reverts to a journalistic style of writing to describe the efforts of one Treb Heining, the “confetti master” that oversees this project. The banality of the text’s beginning is then recapitulated as Ron silently reminds himself to start writing “00” on his personal checks. Nearby in the gallery are two sculptures, j and 6, recreations of luscious and metallic-colored balloons that once held the forms of their titular characters. Since we can anticipate the flat surface along which these works meet the floor, we quite readily read them as images and not actual deflated balloons. Just like in the newspaper clipping that these pieces are rendered from, there is sparse verisimilitude to be found in j and 6. 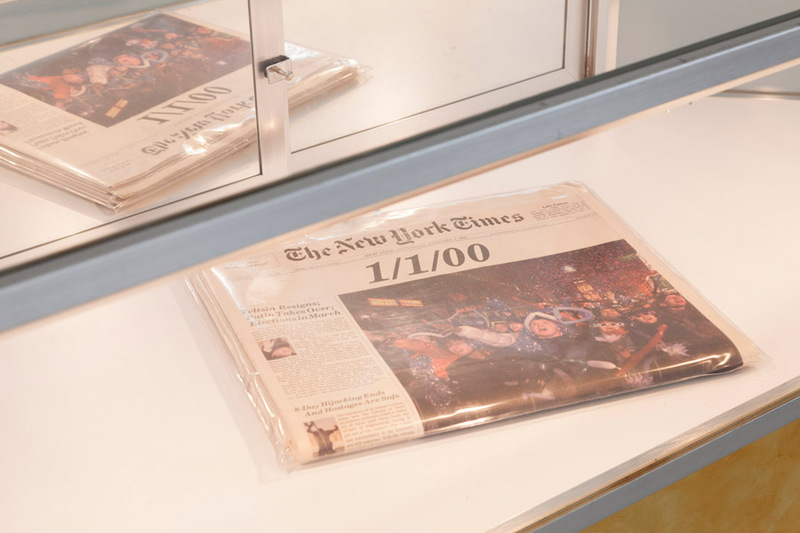 It is because we never really believe the authenticity of the confetti story or sculptures—this is definitely not a newspaper article, this is definitely not a balloon—that these artworks open onto something far more compelling than a trite flirtation with the hyperreal. Rather than falling back on that tireless ‘is-it-real-or-is-it-fake’ approach, Salane instead spins an ekphrastic yarn with these pieces, developing the narrative through image and material rather than rising and falling action. For there is something achingly pitiful about a man, tired and tasked with ensuring the fun of others that remembers in the millennium’s twilight to write the right year on his forthcoming checks. And the voided party favor on the floor was never really there to prove that this thought occurred, because of course it occurred, it occurs to every real and fictional adult obliged to pay rent on the first of the month; the sagging plaster balloon is there to amplify the tacit agony that is already written and vice versa. It is in constellations of artworks like these that one resolves the most rewarding takeaway of All These Events Are True, But None of Them Happened: that the truth or happening of any event are moot if that event can be reconstructed as a genuinely moving story. All These Events Are True, But None of Them Happened ran at Carlos/Ishikawa until April 14, 2108. May 10, 2018 | Filed under Art Seen: International and tagged with Carlos/Ishikawa, Rose Salane.